The summer of better than average movies continues (the exception being a certain Michael Bay-directed toy commercial that shall remain nameless) with the eighth Planet of the Apes movie. Unlike most sci-fi franchises, Apes has always been aimed more at adults than kids. Even the worst of them, such as Battle for the Planet of the Apes or Tim Burton’s “reimagining” at least have some interesting ideas in them. Dawn has a tough act to follow after Rise of the Planet of the Apes redeemed the franchise, and the loss of director Rupert Wyatt was a troubling sign. Luckily, they picked Matt Reeves to replace him who, after Cloverfield, Let Me In and now this, is one of the best genre filmmakers currently working. Don’t be surprised if they throw a Star Wars movie at him in the near future. Dawn is set 10 years after the previous movie and the opening credits helpfully fill us in on how the Simian Flu wiped out 90% of the world’s population. We see Caesar (Andy Serkis) leading the apes on a hunt and the CGI on these characters is so flawless that I basically thought I was watching real apes conversing in sign language for the first ten minutes or so. Then the humans show up with guns (the NRA will not like this movie) and everything starts to go to hell. The film never answers why a human colony sprung up right at the source of the deadly virus or how they didn’t run into the apes living just over the remarkably uncluttered Golden Gate Bridge before now, but I went with it. The human characters are not as well developed as their ape counterparts, though Jason Clarke makes a likeable protagonist and Gary Oldman (who almost played Thade in the 2001 Apes) adds some depth to his warmongering role. Despite the best intentions of the good humans and apes, a series of misunderstandings and plain old idiocy lead to all-out war. 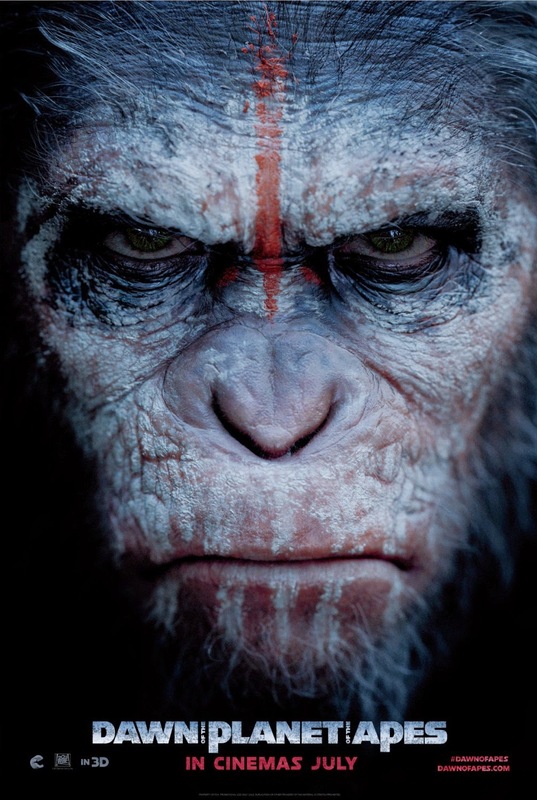 Koba, the scarred chimp that Caesar rescued from the lab in Rise, emerges as the true villain, shooting Caesar and taking control of the tribe so he can turn the other apes, including Caesar’s son, against the humans. The final battle, including a dizzying shot where Koba takes control of a tank, is fantastic. Anyone who wants to see apes charging on horseback guns blazing will not be disappointed. The ending fits right in with previous downbeat Apes endings, with Caesar realizing there will never be peace between the species. Andy Serkis deserves an Oscar nomination (not that the Academy will ever recognize motion capture as acting) and Toby Kebbell is equally good as Koba. The scene where he imitates a circus monkey before killing two men guarding the armory is both amusing and chilling. Dawn is a remarkable technical achievement but it’s also that rare blockbuster that has something important to say. Bring on the next one!